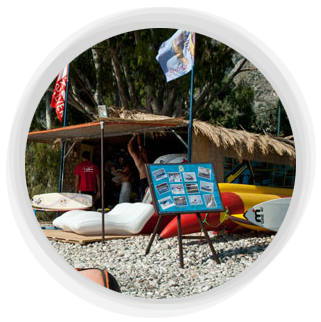 Thalassa Sports is located 6 km from the center of Kalamata at Almyros beach, one of the most organized and crowded area. The access to the beach is easy by car, bus or even bicycle. The waters of the area deepens gradually providing the opportunity to enjoy it with safety. The thermal wind phenomenon starts at noon and creates perfect waves to play with. Find us on the beach from morning till sunset to teach you a variety of water sports at any level of difficulty. Wooded setting and reggae music completes your experience. After long time in the field we responsibly guarantee your safety by retaining the maximum of your fun. Cannot get Kalamae, Greece location id in module mod_sp_weather. Please also make sure that you have inserted city name.